A clean eating recipe for healthy apple muffins. I am not a good baker – but these are super easy (and forgiving if you mess up a little)! The kids love them for breakfast or snacks. Flavored with cinnamon and maple syrup, they are gluten free and don’t have any oil, eggs, or butter. What they do have is fiber, protein, and healthy fats from oatmeal, flax and chia seeds! Bake and enjoy! I have had a routine – a quick and easy breakfast / morning routine. I frequently included my chocolate chocolate chip muffins. They are healthy muffins that my boys both loved. I would warm these delicious muffins up a bit, let the chocolate get a little melty, and then round it out with a protein and some fruit. We were golden. I loved the routine, because it was “familiar, easy, and quick.” And then it happened. My boys decided that – in their reality – my beautiful morning routine was more like “boring and over-used.” Now I had to come up with a different easy, but healthy, breakfast. Necessity, they say, is the mother of invention. What they don’t tell you is that sometimes invention doesn’t come until you’ve locked yourself in your kitchen for a weekend; consumed a perfectly paired wine for each batter of the successful, mediocre, and failed muffin attempts; and used your beloved family members as human taste-testing guinea pigs for muffin after muffin after muffin. But that is, in fact, how these healthy apple muffins were born. They are quick and easy for me and delicious for the boys! 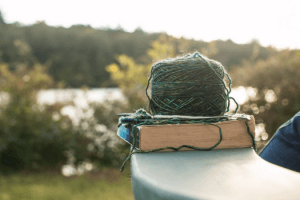 Score – I’m back in business! Oatmeal is a good source of fiber. But there are other fiber powerhouses out there as well. Just one tablespoon of ground flax has 2 grams of fiber! Ground flax is a nutritional power house because of its high fiber content; it’s rich in Omega-3 fatty acids; and it contains phytochemicals known as lignans which may reduce blood pressure, blood cholesterol, and triglycerides. But wait – there’s more!! It turns out that chia seeds are awesome for more than home decor. (Who knew, right?) They are a great source of fiber, phosphorus, magnesium, protein, and Omega-3 fatty acids to mention just a few. And there are so many amazing things you can do with these little seeds! 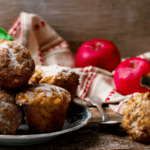 So here is our healthy apple muffin recipe that you’ve been waiting for! These healthy apple muffins are so quick and easy to make as well as moist and delicious. And your kids will love them...If you leave them any! 1 Ripe Medium to Large Banana I squeeze them between my fingers and then whisk them smooth. You can also smash them with a fork and then whisk. 2 tsp Cinnamon Again, the better the quality - the better your end results! 1/3 cup Grade A Dark Maple Syrup You could increase this to 1/2 cup depending upon how sweet you want them. If you increase the syrup to 1/2 - reduce your almond milk to 1 1/2 cups. Whisk in the vanilla and sunflower seed butter. Next whisk in the applesauce. Next whisk in the baking powder, baking soda, apple pie seasoning, and cinnamon. Whisk almond milk and maple syrup into the bowl of wet ingredients. Slowly stir in oats, oat flour, ground flax seeds, and chia seeds. Finally, gently fold in chopped apples and raisins (optional). *Optional - Sprinkle with a little raw sugar on top. Wrapped in a tiny package, this apple muffin recipe has oats, oat flour, ground flax, chia seeds, and apples. And…this is the best part. THE RECIPE IS VERSATILE! By easy and versatile – I mean, you can’t really mess it up. It’s not as exacting as most baking recipes; no precise measuring here. Related Post You May Also Like: Healthy Double Chocolate Muffins So Delicious They Taste Like Fudge! You can also easily change it up – you could add blueberries and cashew butter for blueberry muffins. If you don’t have any allergies to nuts – change up the nut butter and see what you get! Changing to almond or cashew butter, substituting figs and increasing the cinnamon sounds awesome to me. 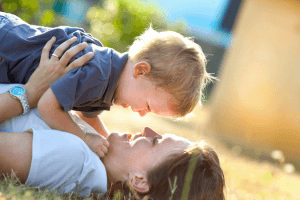 Use your imagination and create your own family favorite! But try these apple muffins first! 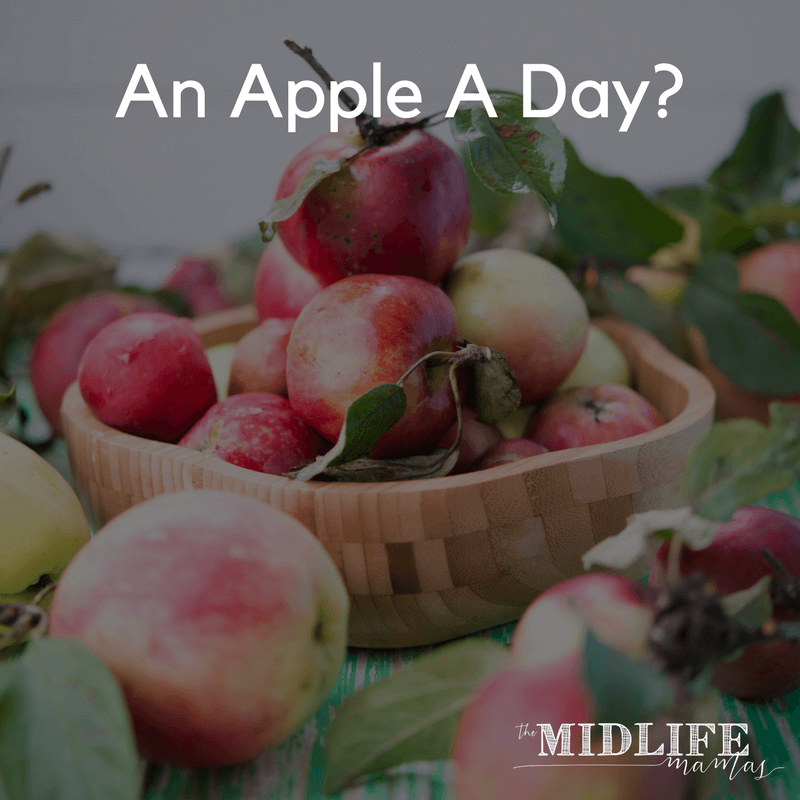 If you sign up below, you’ll get an exclusive bonus of seven additional ways to change these healthy apple muffins up! Let me know how you like apple raisin muffins and I’d love for you to post a comment and let me hear how you changed it up! Also – tell my your favorite kind of muffins! These look delicious and I suddenly have a craving for some apple and raisin muffins. Great the these are so adaptable for those with dietary sensitivities. My toddler has a problem with eggs and dairy which means he never gets any baked treats, but I see these would work for him. Thanks!